The North Korean Talks Initiative is believed to be an effort to improve North Korea’s severe economic condition, which has left millions of North Korean’s dead from starvation and has severely undermined the country’s social and civil infrastructure. Research Papers on North Korean Talks Initiatives take a look at the relationship between North Korea and other nations trying to limit Nuclear Weapons in the world today. Paper Masters custom writes research projects on political science topics such as nuclear weaponry in international politics. 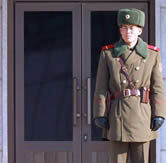 North Korea is the most politically, economically and socially isolated countries of the world. This isolation is manifested by the striking difference between North Korea and it neighbor South Korea, with it democratic government and its flourishing economy. The relationship between North and South Korean has been one of strained tolerance, mistrust and a purposeful lack of communication, especially from the side of North Korea. This lack of communication between North Korea and its neighbor South Korea and the world at large has caused considerable concern about North Korea’s foreign policy strategies. This is especially true with regard to the development of North Korea’s nuclear capabilities, the prospect for which is especially disconcerting when considering the hostile stance that North Korea takes with all other countries. North Korea’s reputation as a hostile country makes initiatives for developing a relationship with the country questionable. For example, North Korea recently proposed unconditional talks with South Korea and the United States allegedly to defuse the threat of war. Experts believe that the talks initiative is an effort to improve North Korea’s severe economic condition, which has left millions of North Korean’s dead from starvation and has severely undermined the country’s social and civil infrastructure. United States and South Korean leaders have rejected North Korea’s talks initiative until the country can demonstrate clear indications that it wishes to end hostilities with South Korea and the world. Reviewing what has been written about North Korea’s current nuclear program, it becomes clear that the current situation is quit tenuous for the United States. In addition to the fact that North Korea’s nuclear program poses a threat to the safety of the international community overall, researchers note that the development of the country’s nuclear program could have destabilizing impacts on the entire region. As the nuclear capacity of North Korea grows, South Korea and Japan may begin their own development of nuclear arms. Further, if South Korea decides to sell its nuclear materials to other countries—as it has done in the past with drugs and missile technology—the proliferation of nuclear weapons may continue in a host of developing nations. The goal of these talks is to provide a common ground for negotiating nonproliferation agreements that will improve international security. In addition to engaging in six-party talks, the U.S. government is also currently pursuing a program of trade embargos that would limit the economic power of the North Korean government unless the country is willing to engage in a nonproliferation agreement. Even though the current methods of negotiation are viewed by conservatives as the best methods for dealing with North Korea, researchers have noted that the current policy does not match past trends. According to experts, under the Aged Framework, North Korea was to be given financial support for the development of new energy technologies in return for freezing its nuclear arms program. Under this program, the goal was not to impose economic sanctions that would serve as the basis for coercion. Rather, the goal was to create a system in which mutual support for energy development could be coupled with improving international security. Examining why current foreign policy toward North Korea has changed so drastically, researchers have noted that when the U.S. discovered that North Korea was engaged in the development of nuclear arms in 2002, President Bush argued that the settlement that had been reached under the 1994 Agreed Framework had been breeched. Because North Korea had effectively cheated, the U.S. had the right to take more aggressive action toward the country in reducing its nuclear arms. Thus, instead of pursuing a more peaceable means of negotiation, the Bush administration has determined that hardnosed tactics such as trade sanctions are warranted in this case. For North Korea, this change in policy has left little room for the government to strategically improve its position in the global community. Unfortunately, the current six-party talks that have been taking place between the U.S. and Asian countries has been halted by the decision of North Korea to leave. While this has spurred further trade sanctions from the U.S. government, it does not appear as if these sanctions are having a positive impact on the situation overall. As North Korea becomes more disenfranchised from the international community, the chances for nuclear arms proliferation continue. For this reason, there is a clear impetus for the U.S. government to reconsider its position on the issue and determine what changes could be made to the current situation to make it more advantageous for all parties involved. Unfortunately, at the present time, the policies being pursued by the U.S. against North Korea are having a detrimental impact on establishing formidable relationships between the U.S. and North Korea. If the situation continues to deteriorate, it is possible that the U.S. may see the proliferation of nuclear weapons in other Asian countries. For this reason, there is a need for the U.S. to change its policy, perhaps returning to the guidelines established under the 1994 Agreed Framework. If the United States does not make some effort to improve the current negotiations with North Korea, it is possible that U.S. foreign policy could have a greater impact on nuclear proliferation than the North Korean government. Korean War research papers examine the conflict between South Korea and North Korea from 1950 to 1953. Paper Masters writes custom research papers on North Korean Talks Initiative and how North Korea is the most politically, economically and socially isolated country of the world.